NETWORK FINALS: BIG BROTHER gained 0.1 in final numbers, and both episodes of MARLON and the 10PM MODERN FAMILY rerun lost the same. CABLE HIGHLIGHTS: The season finale of FX’s SNOWFALL dropped 0.05 to 0.39. E!’s TOTAL BELLAS returned at 0.31, and ERIC & JESSIE: GAME ON premiered at 0.29. On Tru, INSIDE JOKES gained 0.03 to 0.21, and the season finale of I’M SORRY was up 0.04 to 0.18. The 1-hour season premiere of FXX’s YOU’RE THE WORST was at 0.14/0.12, below the 0.17 for the 2016 premiere. What turned out to be the series finale of Syfy’s BLOOD DRIVE ticked down to 0.11. Hurricane Irma drove ratings again for Weather Channel, which had 4 shows in the Top 10, led by the 9PM WEATHER CENTER LIVE at 0.59. VH1’s BLACK INK CREW held at 0.56, and SIGNED ticked down to 0.38. 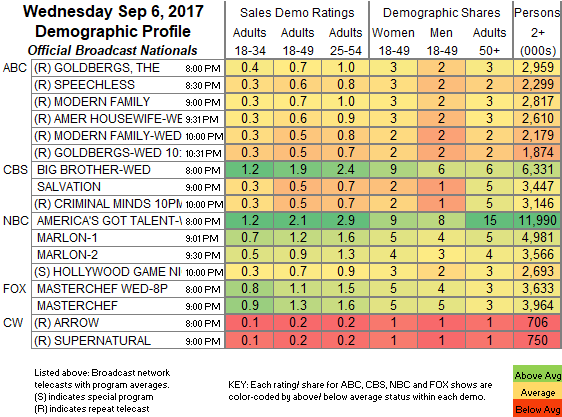 On USA, THE SINNER continued to impress, up 0.03 to 0.55, while lead-in SUITS was up a tick to 0.40. ESPN’s US OPEN coverage was at 0.54. For once it was CNN leading a big news night, with ANDERSON COOPER 360 at 0.45/1.9M, above MSNBC’s RACHEL MADDOW SHOW at 0.39/3M, and Fox News’s THE FIVE at 0.33/2.9M. On ID, SHATTERED lost 0.03 to 0.36, and HOMICIDE HUNTER was down 0.09 to 0.33. OWN’s GREENLEAF rose 0.02 to 0.35. On Food Network, WORST COOKS IN AMERICA ticked up to 0.34, and COOKS VS CONS was down 0.02 to 0.25. On Discovery, GARAGE REHAB dropped 0.05 to 0.33, and. MISFIT GARAGE was down 0.03 to 0.30. On HGTV, PROPERTY BROTHERS was steady at 0.33, HOUSE HUNTERS INTL shed 0.03 to 0.29, and HOUSE HUNTERS was at 0.29. TV Land’s YOUNGER fell 0.04 to 0.24. A CATFISH special on MTV was down 0.14 from last week’s regular episode to 0.23. 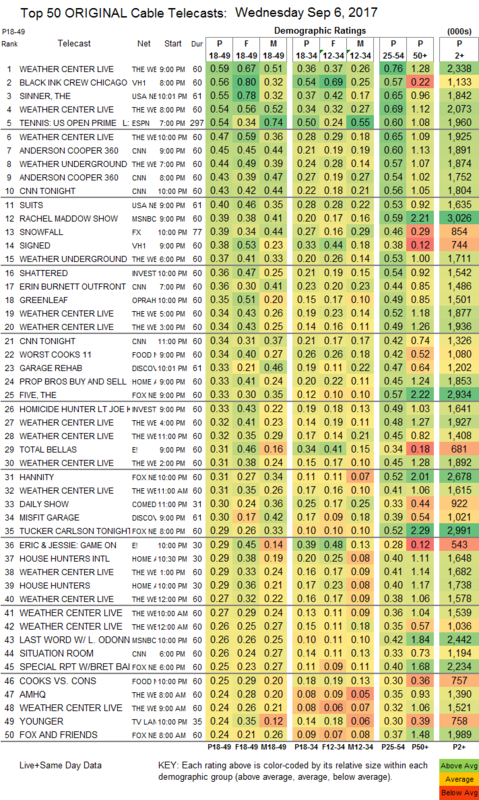 On A&E, WAHLBURGERS was at 0.22/0.22, compared to last week’s 0.20/0.19, and THE LOWE FILES was up 0.03 to 0.13. Bravo’s VANDERPUMP RULES: JAX & BRITTANY was at 0.20, and ODD MOM OUT was up 0.02 to 0.18. Lifetime’s GROWING UP SUPERMODEL dropped 0.04 to 0.09. We don’t currently have ratings for POP’s SWEDISH DICKS or IFC’s BARONESS VON SKETCH SHOW, which fell below the Top 150 chart.